3000W 3000W 3000W 2200W Effect not known, but according to a review Apex is a little more effective than this one. Silent, effective, very well adjustable, metal pump, nozzle cleanable during use, long preheating. Rolls-Royce of camping stoves. Silent, effective, very well adjustable, metal pump, nozzle cleanable during use, long preheating. 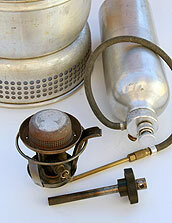 KAP-copy of Optimus Silent, effective, very well adjustable, metal pump, nozzle cleanable during use, long preheating. Inconveniently small tank. Replaced by a new model Hiker+ with a Nova burner. Not recommended for winter camping because of high noise. Silent, very well adjustable, short preheating, plastic pump. In USA only with gas generator, in Europe kerosene generator may be included. Quite silent, not so well adjustable, plastic pump, short preheating. Production finished, but because of having long life they still exist for a long time. May be possible to purchase as used. Price 70–90 € Price about 112 € without a bottle. In this table I have included such stoves, which can to my mind be used for heatig of a winter tent. It means that only the models which are silent enough for continuous use while being awake come to question. Declared users of XGK say indeed that it is possible to get used to the noise. Several burners mounted in the windshield of Trangia (by Tue Olesen, in Danish). Notes and corrections to this table and to the whole site you can mail to the address luontola (at) dnainternet.net, thank you. 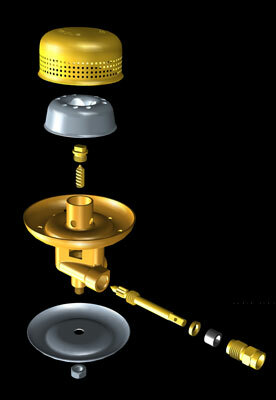 A quiet Cobra burner used in Optimus stoves Explorer II and Hiker 111C, an explosion and a section view. Fuel from the bottle comes into the bottom of the right vertical channel. From there it goes up to a doughnut-shaped channel, where it is vaporized. 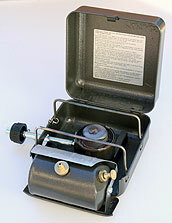 Kerosene vapour goes down by the left channel, through the valve hole and past the cleaning needle to the jet. In the middle channel air is mixed with the vapour, which burns outside the outer cup, "the hat". 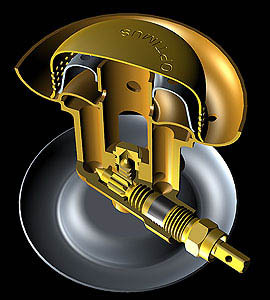 When the valve is turned open, the cleaning needle rises upwards. At its extreme position the needle cleans the jet. This can be made during burning.